The first Denver Cyclone day of the year - Woohoo!...............And it could have been soooo much better than it turned out, but even so we had a great stormchase with the DCVZ. When we awoke in Burlington there was only one thing on my mind, wise words from Stuart Robinson a few years ago told me to head straight to Bennett or DIA (Denver International Airport) as these areas always see one of the biggest storms initiate along the front range near Downtown Denver and head North-Eastwards towards this point and most Landspout type Tornadoes occur near these location. 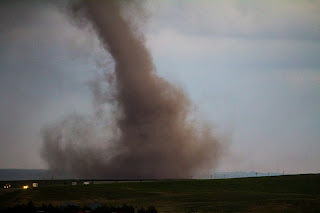 Well it would have been if the EF1 Landspout Tornado had waited just another 30 minutes and we would have been right there to witness it scooting across the runways of DIA. Our start of the day did not get off to a great start with a flat battery on the rental car, the nice deputy sherriff of Burlington came along and gave us a jump start to get us on our way, lunch in Limon was followed by some shopping for half and hour. Whilst all this was going on our little storm west of denver had left the security of the front range and exploded into life dropping the Tornado before 2pm Mountain time! DOH! We spent the next few hours stair-stepping down the Denver Cyclone and actually got onto another 4 Tornado Warned Storms, a few had funnels, one of them near Kit Carson wrapped up so much I could not believe a tornado had not reached the ground, the wall cloud was spinning right in front of us, but quite quickly the storm was morphing from inflow to outflow and could not get the right balance for a photogenic tornado, what it did have in it's outflow stages was some great shelf cloud structure. We followed this storm all the way back to Burlington again and finally ate Chinese at our Hotel/Restaurant there. This was almost a carbon copy day to the 16th but a little further east and a slightly better chance at a Tornado today. We had lunch in Ogallalla and headed westbound towards Kimball.......Again! Small storms and lots of them were vying for supremacy for a few hours so it was the waiting game. Finally 2 Supercells sorted themselves out near Sterling and Brush so it was south we went for a hopeful intercept, along the way both Storms became Tornado Warned and seeing as we were on the North West side an intercept would be quite tricky, amazing Mammatus filled the whole sky on our approach to the storm down that same road south from Kimball. After about 30 minutes we got into a position to see the workings of the storm but from the west and south-west side only, just south of Interstate 70 we saw some very fast rotation with areas of scud clouds being ripped to shreds in an almost tornadic circulation, tonnes of dust and sand were being kicked out of the storm, we followed the storms east towards Burlington and ended the day with a pretty rainbow shot and a view of the chase vehicle for this year. Started the day in Sterling and knowing that my good friend Dave Ewoldt was in town and was chasing this risk it was too good an opportunity to miss when we arranged to chase together. Dave has been chasing in the USA For nearly 32 years and he also mentored me in the 2008 Season, when an opportunity like this turns up you grab it with both hands as the chance to learn even more on a chase day is too good to pass up. We went south and east to the small town of Madrid and watched the Supercell morph very quickly from a Classic Supercell to a Massive HP Supercell Hail Machine, at the point of the following picture it was spitting out 4" Hailstones. We were also watching a line of mushy storms moving North East from Eastern Colorado towards out storm and worried they would interfere with ours. At once Dave said lets go and head north, a quick look at his radar confirmed the Outflow Boundary had already interacted with a storm SE Of Chadron and already dropped a tornado almost at once. A few storms in between that storm which was 100 miles to our north were moving towards the outflow boundary so it was north back towards Interstate 80 we went, our target storm was near Arthur, we got to it in quick time but as soon as this reached the boundary it promptly died. Another healthier looking Supercell about 30 miles further north was the next target, this had some cracking LP Supercell structure but once again this struggled as it moved east, something just was not right now which was earlier. Onwards we kept chasing the storm towards North Platte but apart from putting on a little bit more structure ultimately the storm was in its dying phase, so we cut off the chase after trying to get Ian and Dave hit by hailstones (That failed as well LOL) The Storm literally vanished within 30 minutes. After the great success of the Warm Front day yesterday (14th) we found ourselves with 2 targets today, one in Iowa and the other in Colorado, we had overnighted in Council Bluffs but the decision was made for the huge boring blast across Interstate 80 towards Colorado and hoping storms would hold off until the early evening, also the next few days looked like classic high plains chase days and some upslope magic. After driving for what seemed like an eternity we approached the intersection in Western Nebraska where the I-76 & I-80 Branch off in different direction, some storms were already rolling into the Western Nebraska Panhandle from the Cheyenne area so we went west towards Kimball and intercepted some storms that were on a south-eastwards heading, this road would become a much used road over the next week. The Supercell on its approach was on a weakening, pulsing stage and did not look that great so we got just east of it and let it nearly over-run us, I say nearly because at the most crucial point we heard hail roar above our heads and it was clear this storm was going for one last push and almost at once some golf ball sized hail started to hit the car, we headed south pretty quickly and got out of the core, others who came past us were not so lucky with numerous cars suffering cracked windscreens driving past us. Upon reaching Stoneham we looked back and saw some pretty decent structure on this LP Supercell which was about 10 Miles to our North East. We followed this storm towards Sterling where it was in its final throws of the day and was losing all radar reflectivity, it gave us one final show whilst we were eating dinner with that classic flying saucer dying LP Supercell stage.